Love Is Buzzing in the Good Old Summertime! Spend the sunny days of summer relaxing with an ice cold glass of lemonade and revel in the dreams of twelve brides who are a bit surprised by how the men of their dreams come into their lives. Journey to the Old West, stay on the prairie, and visit quaint small towns...without leaving the comfort of your own front porch! Having spent a year in St. Louis, Prudy Willard returns to Advent, Texas, and fills the new mayor's desk with her ideas for improving the town. The only thing they can agree on is initiating the county's first fair. Katie Tucker must overcome her fear of the bees her father left as her inheritance to run the family farm and her fear of those like Pete Dent who offer to help her. He'll rebuild her barn, but is his friendship genuine? Lucy Powell is widowed with two children, but she is reluctant to accept Buck Reiter's help on her neglected farm. Can the old cowboy convince her his interest is more than charity? 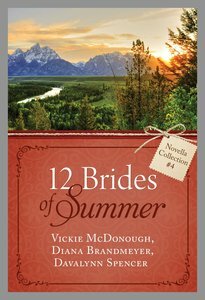 About "12 Brides of Summer Novella Collection #04 (#04 in 12 Brides Of Summer Novella Collection Series)"
VICKIE MCDONOUGH is the author of over twenty books including the "Texas Boardinghouse Brides" series. Vickie's books have won the Inspirational Reader's Choice Contest, Texas Gold, and the ACFW Noble Theme contest. Vickie lives in Oklahoma and is a wife of 35 years. She has 4 grown sons and one granddaughter. Visit Vickie's website: www.vickiemcdonough.com. Davalynn Spencer is a public school teacher, award-winning journalist, and former religion editor whose stories and photographs have appeared in Sunday school publications and national magazines such as the Western Horseman, American Cowboy and Prorodeo Sports News. She speaks and sings at womens retreats and currently writes, About Your Kids, a weekly education column for a midsize daily newspaper in California. She is also a wife and mother and lives with her husband Mike in the foothills of Californias Sierra Nevada mountains. Customer Reviews For "12 Brides of Summer Novella Collection #04 (#04 in 12 Brides Of Summer Novella Collection Series)"
The 12 Brides of Summer Novella Series are fantastic stories. With a wide variety of authors, characters and settings there is a story for everyone. I loved reading these short stories and escaping to another time and place for a quick read. I would definitely recommend these books to others.